These two workers were enjoying what was most likely a well deserved break when I selfishly snapped their photo. 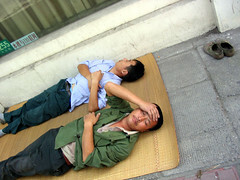 This was back in September when getting forty winks out on the sidewalk was just another fact of life in China. Winter has arrived and with it a biting wind which makes me very nostalgic for those warmer days. I could post a photo of students wearing hats and gloves dashing between classes or of me huddled in front of a space heater but that would just make me feel colder.